Moving slowly to compensate for her hangover, she managed to prop herself against the headboard and, once there, frowned at her bedmate. Who the heck was he? She had no idea, but she was relieved to see that he was no bum off the street. He wasn’t even one of those “he looked a lot more attractive last night” kind of pickups everyone joked about. This guy was so far above average that she began to wonder why he wasn’t already taken. Heaven forbid that was the case! She didn’t see a ring on his left hand, which rested on the pillow above his head. But he had to have some story. If he looked this good sleep-tousled, she could only imagine what he’d be like once he had a chance to clean up. It was his bone structure, she decided. Those pronounced cheekbones. The narrow bridge across his nicely shaped nose. The distinct ridge of his upper eye sockets. He also had a strong chin and a manly jaw, which certainly didn’t detract. So maybe she couldn’t point to just one or two features. With his long, sandy-colored hair spread across his pillow, he resembled a fallen angel—and his body further enhanced that image. Although bedding covered his lower half—thank goodness—she could see his torso. He was built like a greyhound or panther, lean and sinewy and ideally proportioned with very little body hair. What body hair he did have was golden and downy, as appealing as his tanned skin. He’d make a nice subject for a painter, she mused, someone looking for refined masculine beauty—a man who could even be called elegant. But not everything about him was elegant. When she looked closer, she could see that he had some very unusual scars…. What types of injuries could’ve caused those? she wondered. It seemed to her that he’d been shot, and more than once. Several round, bullet-size marks dotted his chest. Then there was a long, jagged scar on his side that must’ve come from something else…. Out of nowhere—he didn’t open his eyes first, so she had no warning—he grabbed her wrists in a crushing grip and slammed her onto her back. Eve gasped as she stared up at him. Gone was the image of an angel, fallen or otherwise. Shocked at being so easily and unexpectedly overpowered, she couldn’t even scream. His fierce expression, as if he was intent on causing her bodily harm, made it worse. Had she brought home a homicidal maniac? Was he about to kill her? The terror that surged up must’ve shown on her face because he suddenly came to his senses. He gave his head a shake. His expression cleared and, letting go, he eased off her and slid back onto his side of the bed. “Sorry about that. I thought…” His words trailed off, and he covered his eyes with one arm as if he needed a moment to pull himself together. “They never are,” he muttered. New York Times & USA Today Bestselling Author Brenda Novak is the author of more than fifty books. A four-time Rita nominee, she has won many awards, including the National Reader’s Choice, the Bookseller’s Best, the Book Buyer’s Best, the Daphne, and the Holt Medallion. She also runs an annual on-line auction for diabetes research every May at www.brendanovak.com (her youngest son has this disease). To date, she’s raised over $2 million. For more about Brenda, please visitwww.brendanovak.com. 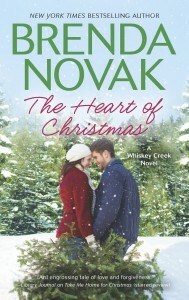 This was the first book I have read by Brenda Novak ~ and I loved it! I will be going back and reading some of the others, I liked this one so much. Eve is one of the only one of her friends not married and is having hard time being by herself. On her 35th Birthday everyone was busy so she went out by herself. The only thing was she didn’t end up alone the next morning. Eve found herself with a hot guy in her bed. That was not something she did. When Jared got up he agreed with Eve this was just a one time thing. She manages one of the local B & B’s and finds out one of the guest is Jared – she is not happy and tells him to move on. The only thing is she couldn’t forget him and he felt the same way. The only thing is Jared or is Brent or Rex is running from something and he doesn’t want to hurt Eve. He can not get involved, but Eve is what he is looking for. 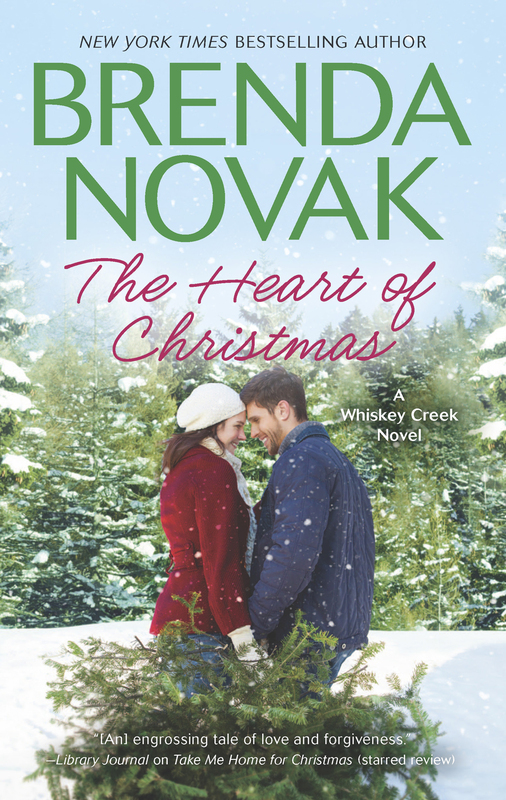 You will need to read The Heart of Christmas to find out what happens. If you’re interested in reading more Whiskey Creek, the first two books are currently on sale in digital for only $1.99 (for a limited time). That would be WHEN LIGHTNING STRIKES and WHEN SNOW FALLS. I received a Copy of this book from the author for purpose of honest review. I was not compensated for the review, and the review is honest and my responsibility.